Hey everyone, Alex here with a quick report about my State Championship run. Unfortunately, I don’t have time to put together an Underground article up to my usual standards this month. I’m graduating in a few weeks and my senior design class demands an insane amount of my time. However, I’ve gotten a few requests for this article so I figured I’d give you all a short read while States are still fresh in your minds. Christopher Schemanske and I pride ourselves on our State Championship deck choices, especially for the first weekend. 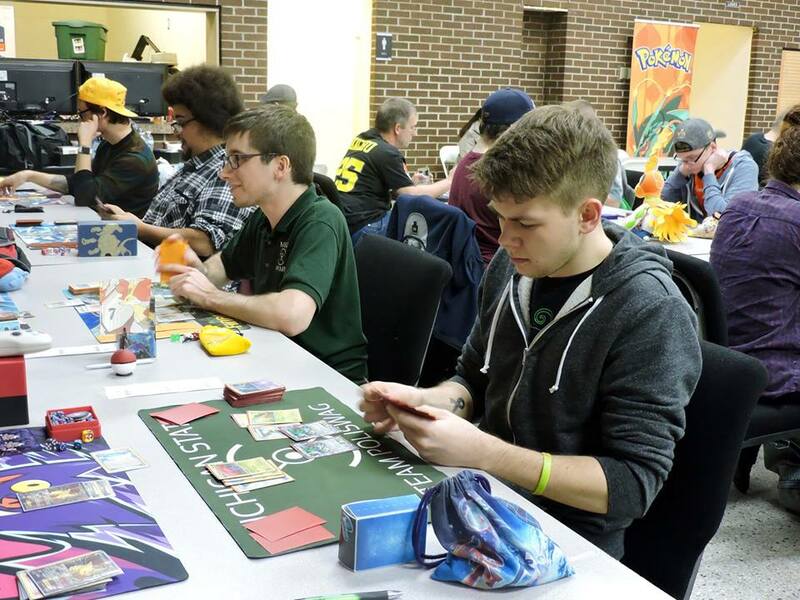 In fact, our friendship and testing teamwork both stem from when we worked together on a Landorus-EX/Garbodor deck for Ohio States in 2013 (which took 1st place in both Masters and Seniors). This year, I felt very prepared for the first weekend. The metagame was very easy to predict as it usually is. For the first week of States, the most popular decks are almost always whatever was popular at Cities with a small amount of the new hyped decks that came about from the new format. I figured people would play a lot of Night March and Yveltal, with a little bit of Greninja as well. I thought Trevenant might see a little play but Yveltal would be too popular for it to be very successful. After my initial testing, the deck I liked the most was a very plain Yveltal/Zoroark/Gallade list with Puzzle of Time thrown in. I saw some good success at LCs but it rarely beat Greninja and the Night March matchup was pretty shaky. Yveltal also had trouble against random decks like Mega Rayquaza and even Mega Manectric if you couldn’t get out the Gallade quick enough. I changed my focus one week before the first State Championships due to some guidance from my friend JW Kriewall. 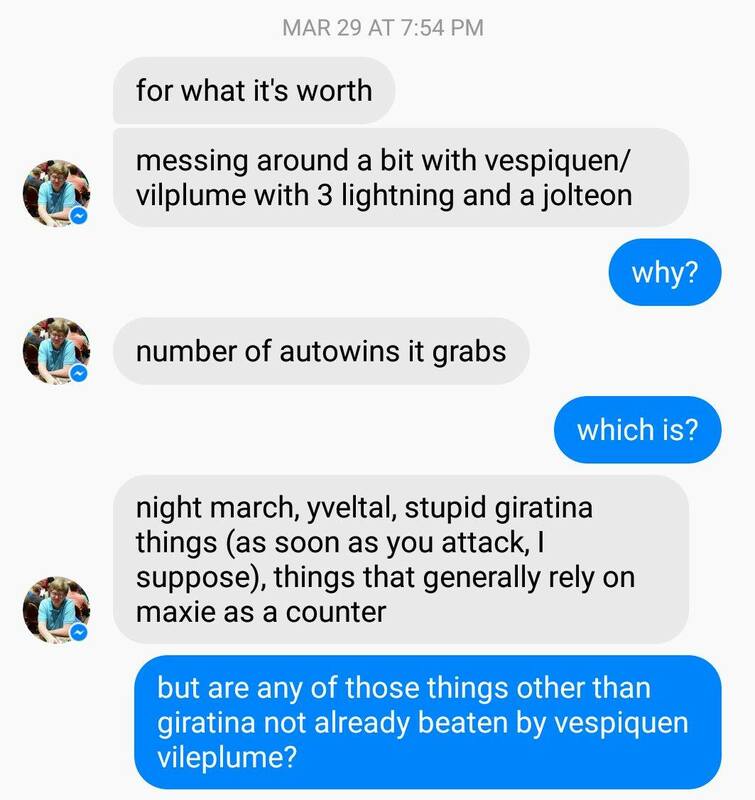 He told me about a Night March/Vespiquen list that he was testing and how it beat almost every deck in the format. Sure enough, I picked it up and found it to be incredibly strong. Night March variants were appealing to me as they were able to punish anyone trying to play any decks that focused on Pokémon-EX. Adding Vespiquen covered your bases against Seismitoad-EX and Jolteon-EX and also gave you a good attacker that Yveltal XY couldn’t OHKO. I ended up playing a list pretty similar to the list from my last article. In my initial testing, I neglected to include Teammates which was a huge mistake as it can grab crucial Puzzle of Times late in the game. We also cut down the Dimension Valley count, instead focusing almost exclusively on attacking with Joltik and Vespiquen. This gave us space for cards like Parallel City and Target Whistle which were instrumental in winning the mirror match. In the end, five players piloted this list during the first weekend, as well as Henry Ross-Clunis who changed a few cards to play in Pennsylvania. Every player who played our list finished in the Top 16 or better across three different states, with my roommate and close friend Chris Derocher having the most impressive performance of 3rd place in Michigan. I ended up going 5-2 (with one of those losses being to a 60-card mirror match, the only time I would lose to Night March throughout States) giving me 30 of the 50 CP that stood between me and an invitation to this year’s World Championships. My deck choice for the first weekend of States was easy. I didn’t play in Week 2 and I’m incredibly glad I didn’t. After Night March dominated in the first weekend, I knew there would be an insane amount of counter decks and I didn’t know how to deal with those. Even though it is the most successful and most powerful deck in the format, Night March has a lot of weaknesses and a counter deck could take any number of forms and be successful against it. 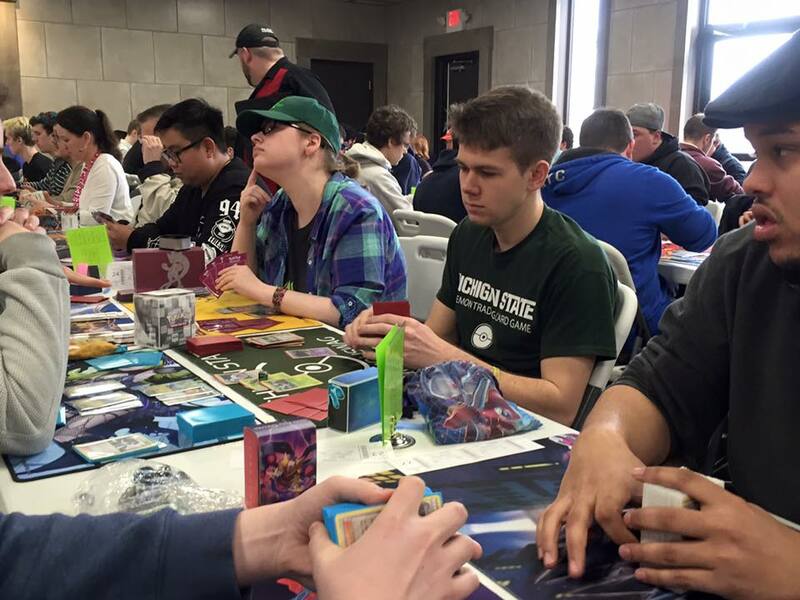 Once again, my friend JW Kriewall had a strong play in the second weekend in the Reshiram/Giratina deck that Kevin Baxter and Dustin Zimmerman cooked up. He was able to make Top 8 with the deck and although his tournament run was not as impressive as others, I started to see the deck gaining traction in the community. JW chose to share the list online and after watching it dismantle Night March time and time again, I knew it would see some play in the third weekend. Greninja was another deck that was being hyped as a Night March destroyer. Players started to figure out the best lists for the deck and it was the second most successful deck during Week 2. Although Night March can beat Greninja by using a liberal amount of Hex Maniac and overwhelming them, this is usually pretty hard to sustain and just one or two turns of Abilities is all the deck needs to turn the game around. I was at a loss for what to play for Indiana States. Part of me wanted to stick with the same Night March/Vespiquen list from Week 1 but I was afraid of counter decks and the mirror match was pretty unappealing as well. Early in the week, Christopher pitched to me an unorthodox Vespiquen/Vileplume deck with some funny techs. As you can see, I was pretty skeptical at first. Jolteon-EX? That’s just silly. However, as the week went on, I had no better ideas so I started testing out his list. 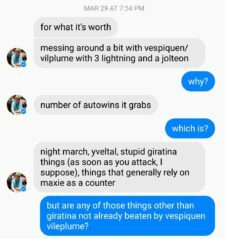 Vespiquen/Vileplume actually made a lot of sense for the expected metagame in Week 3. I thought Night March would continue to be played in high numbers due to the relatively low skill needed to pick up the deck and play it decently as well as its sheer strength. As I mentioned before, Greninja and Reshiram/Giratina were likely to see play. I also thought Seismitoad-EX would make a resurgence as an alternative partner for Giratina-EX. Greninja and Seismitoad both suffer from Grass Weakness, and Giratina and Night March decks are completely walled out by Jolteon-EX, so the deck seemed almost too perfect. 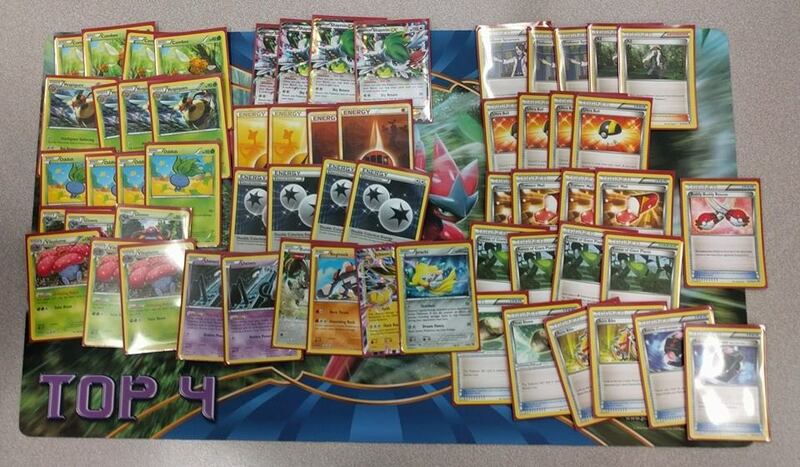 Other than the addition of Jolteon-EX, the list is pretty similar to what Andrew Wamboldt played to win the Missouri State Championship in Week 1. The basic Lightning Energy may only seem to serve as a means for Jolteon-EX to attack but they give you more options for retreating an unfavorable starter and a way to attach Energy under a lock from Giratina’s Chaos Wheel. Jirachi XY67 was added as insurance against Giratina decks, allowing you a turn to attach a DCE to your Jolteon and prepare to sweep. It also helped when a game against Night March started to spiral out of control, especially since discarding an Energy card was nearly as good as a knockout under Item lock. A 2nd copy of AZ was a quick addition to help with games where you have to play down the Vileplume without attaching a Float Stone, and it also let you use Items for a turn in a pinch. Revitalizer was the last thing that we added as another way to find the necessary pieces to get out a Vileplume. The synergy with Battle Compressor was too good to pass up. I also used it often in the late game in conjunction with AZ to find another Vespiquen line when I was out of attackers. In hindsight, the inclusion of Revitalizer exposed a fatal flaw in my testing mentality but I’ll touch on that more later. Unfortunately, my day went pretty poorly and I ended up 3-4 after a strong 3-1 start. However, my four other teammates had positive records with the deck, and all were in contention for the Top 8 cut going into the penultimate round. When all was said and done, Patrick Brodesser ended up with the unfortunate 9th place bubble but Chris Derocher continued his streak of dominance with a 2nd place finish. He lost in the finals to Mega Manectric, a theme we recognized when looking back on the weekend. Even though I had one of my worst performances in recent memory at this tournament, I wasn’t dismayed with the deck. I had some bad luck, my opponents had some good luck, this sort of thing happens. I also noticed that this tournament had a very low amount of Night March decks which allowed for decks centered around Mega Pokémon to thrive. Instead of lamenting my poor tournament, I instead changed my focus to the next weekend. Going into the final week of States, I placed a lot of pressure on myself to do well. I really wanted to earn an invitation to Worlds this weekend, especially as I will only be attending two Spring Regionals and my chances were quickly running out. I wasn’t exactly sure what to expect in Ohio as the players from the area who also attended Indiana’s State Championship played everything from Trevenant to Yveltal/Vileplume. I spent a lot of time this week testing with my teammates, working on everything from Trevenant to Mega Manectric to Night March. All I wanted was a consistent deck that I thought I could pilot to a 5-2 record. Even though Night March would likely be countered, I knew it was the best deck in the format for a reason and it deserved consideration once again. Even after spending a lot of time testing and consulting some players from other regions, I was completely undecided on which deck I would play just 12 hours before the tournament. Thankfully, my friend Sean Foisy went to the League Challenge near the venue on Friday night and was able to scout out what was popular. He reported seeing 15 Night March decks out of the 27 players in the event, in addition to 4 Yveltal, 4 Trevenant, and 4 “other” decks. Besides the Trevenant decks, this metagame was incredibly favorable for Vespiquen/Vileplume and I was more than willing to give the list another shot. We went to bed with five copies of the deck ready to go, other than a few Jolteon-EX that we would need to borrow once we got to the venue. We made a few improvements to the list, first adding another copy of Professor Sycamore in place of a Battle Compressor. It’s pretty hard to draw into what you need under Item lock and another copy of Sycamore let us find cards like Jolteon and Lightning Energy after the first turn. Surprisingly, Battle Compressor is not that great in this deck. It’s almost completely dead before you find an Oddish and a Gloom as everything in your deck is important in almost every match. Vespiquen’s damage output is basically an afterthought in a format that is dominated by non-EX Pokémon and setting up a Vileplume is more important than dealing a lot of damage. The most important change from the week before was cutting the Revitalizer in favor of a Buddy-Buddy Rescue. Revitalizer was great in a few situations but often hurt more than it helped. The restriction to only grabbing Grass Pokémon was more harmful than we initially realized, and being forced to grab 2 Pokémon often weakened your Set Up draws and the damage output of Bee Revenge. When Revitalizer was able to grab the Gloom and Vileplume to finish off a lock, it was amazing. However, in testing those moments overshadowed the times where it was less than helpful. This sort of tunnel vision can be very detrimental when constructing a deck list so be sure to reflect on your testing honestly so you can avoid it. In the morning, Sean came up with the final major addition to the deck, Regirock AOR. I’ll admit, I was once again skeptical when he first suggested it. However, it was a great counter to Mega Manectric decks as it could pick up an OHKO where Vespiquen often couldn’t as well as surviving a counter attack from a second Mega Manectric. I recognized the potential for a smart opponent to use Overrun to initially damage a Regirock and give them a way to KO it with a Turbo Bolt but I figured it would still give us the advantage we needed to win a close game. We ended up cutting an Unown for the Regirock and an Acro Bike and Lightning Energy for 2 Fighting Energy. I was really happy with how the list turned out and felt very confident going into the final State Championship of the year. The deck performed incredibly well for me throughout the day. I only lost a single game when I went first and even beat Trevenant twice, one of the worst matchups for Vileplume. I want to highlight my 5th round especially as it was the only time that I was able to use Regirock on the day. In the first game, I got the T1 Vileplume down to shut down my opponent but I only had a few Pokémon in my discard pile, leaving me to 2HKO his Seismitoad-EX and give him a chance to set up. Eventually, he found a Giratina-EX and powered it up, leaving me in a tough spot. Giratina can quickly run through my board, especially when my damage output is low. I was able to power up my Regirock and threaten a 2HKO his Giratina. My opponent was forced to use Xerosic to discard a DCE from my Regirock to prevent himself from getting knocked out. This is where Regirock really shined. Had I been attacking with a Vespiquen, he could have used Xerosic on my benched Vespiquen’s DCE while knocking out my Active Vespiquen and clearing my board of Energy. Instead, I forced him to allow me to conserve my Energy and had just enough steam to close the game out. I ended up with a 6-1 record and was first seed for the next day’s Top 8 cut. Unfortunately, I had to play my good friend and teammate Patrick Brodesser in the first round. We were playing the same exact 60 cards so we knew it would be a pretty uninteresting matchup. The Vileplume/Vespiquen mirror match typically is decided by the opening coin flip as the deck relies so much on Item cards to set up. In Top 8, Patrick drew incredibly badly while I set up the T1 Vileplume both games going second. I wish we could have had more exciting games but that is just the way this deck works sometimes. Congrats to Patrick on his first top cut at a major event and for getting very close to his first Worlds invite! I went into Top 4 fearing the worst. Wobbuffet completely shuts down the deck and completely prevents you from setting up in most games. I knew that I would almost certainly lose any game where my opponent started with it so I had to hope for a lot of luck. The video I linked doesn’t show the first game but I went first and set up a Vileplume, completely shutting down any chance my opponent had to establish any board position so he scooped very quickly. The second game featured a T1 Wally from my opponent but I was able to hang on just long enough to get the Shaymin + Sky Return loop started. I found out in this game that my opponent played 2 copies of Head Ringer as well as a copy of Trevenant BKP, both of which can help to shut down this strategy. I didn’t have enough cards left in my deck for this to be successful this game and it ended very quickly. The third game was incredibly exciting in its own strange way. I had a great opening hand but my opponent finally found a Wobbuffet as his starter. I had no way to set up and had to just let him power up a Trevenant on his Bench. Immediately, I knew that I wouldn’t be able to win this game with Vespiquen so I quickly adjusted my strategy to Shaymin looping again. Once I found 2 Shaymin and a DCE, I started using Sky Return over and over. I actually had a Vileplume in play which locked my opponent out of using Head Ringer. 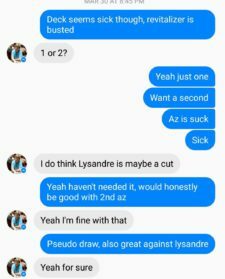 He started digging for Lysandre, intending to trap my Vileplume active and spread with Silent Fear for a few turns to take his last 3 Prizes. Eventually, he did hit it but I had enough Energy remaining to retreat and continue attacking with Shaymin. My opponent used a Judge to try to stop the loop but I drew Shaymin and DCE to stay in the game. He knocked out the Vileplume and quickly used his final Head Ringer on my Shaymin-EX, potentially winning the game. Instead, I was able to AZ the Shaymin, getting rid of the Tool to attack once again. At this point, I realized that I was really close to winning. After checking my opponent’s discard, I saw that he only had 1 VS Seeker left, so a single Judge would decide the game. He played it soon after and I knew that I would win by deck-out if I found a Shaymin-EX and a DCE. Unfortunately, I only found the DCE and lost a heartbreaking match. Overall, I was incredibly pleased with this tournament and my 3rd place finish. I finally made cut at a States or Regional this season and earned the final points to play in this year’s World Championships. I was also very happy to see my good friend, Kevin Baxter, win his first major event after a lot of close calls. In the end, my team’s Vileplume/Vespiquen lists took home over 300 Championship Points in two weekends, including a 2nd place finish from Christopher Schemanske in Massachusetts! You can’t ask for much more than that (although a win would have been nice). If anything, this tale should encourage you to think outside the box. We took a list that was very solid and well refined and found a way to improve a couple of shaky matchups by including unorthodox techs. Don’t be afraid to try something new. We all fail sometimes! Lastly, if you enjoyed this piece, please consider subscribing to the Underground program. Myself and the other writers put a lot of quality pieces out where we offer up high-quality deck lists as well as analyses of them and insight into the thought processes we used to craft them. There’s tons of content each month that can help you prepare for upcoming tournaments as well as just generally leveling up your game. I initially shared a subscription with my roommate and it really helped give me the basis that I built my first World invites off of.